Air circuit breaker are those circuit breakers which operates in air at atmospheric pressure. They are also termed as ACB breaker . They are two types of air circuit breakers. In this post let us discuss Air blast circuit breaker in detail. This type of Air circuit breaker employ a high pressure air blast as an arc quenching medium. 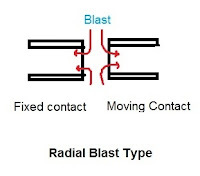 The contacts are opened in a flow of air blast established by the opening of the blast valve. The air- blast cools the arc and sweeps away the arcing products to the atmosphere. This rapidly increases the dielectric strength of the medium between contacts and prevents from re establishing the arc. Consequently the arc is extinguished and flow of current is interrupted. 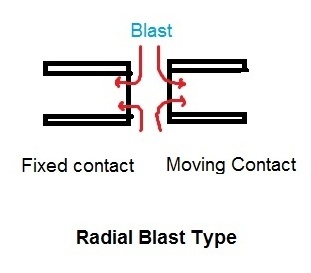 The air blast is directed along the arc path in this type of air blast circuit breaker.The essential parts of a typical axial type air circuit breaker is shown in the figure below. The fixed and moving contacts are held in the closed position by spring pressure under normal conditions. 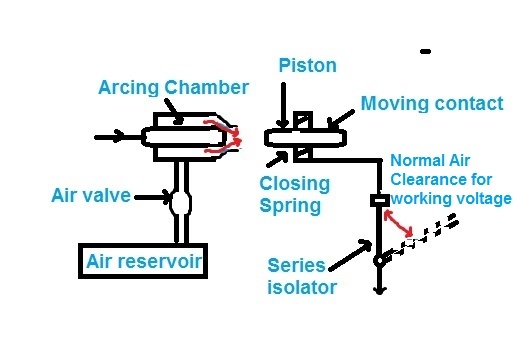 The air reservoir is connected to the arcing chamber through an air valve. This valve remains closed under normal conditions but opens automatically by the tripping impulse when a fault occurs on the system. When a fault occurs, the tripping impulse causes opening of the air valve which connects the circuit breaker reservoir to the arcing chamber. The high pressure air entering the arcing chamber pushes away the moving contact against spring pressure. The moving contact is separated and an arc is struck. At the same time, high pressure air blast flows along the arc and takes away the ionised gases along with it. Consequently, the arc is extinguished and current flow is interrupted. In such type of circuit breakers, the contact separation required for interruption is generally small. Such a small gap may constitute inadequate clearance for the normal service voltage. Therefore, an isolating switch is incorporated as a part of this type of circuit breaker. The air blast is directed at right angles to the arc path in this type of air blast circuit breaker. 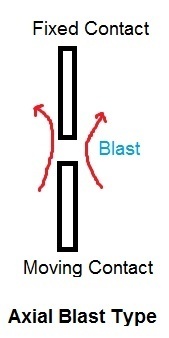 The cross blast lengthens and forces the arc into a suitable chute for arc extinction. 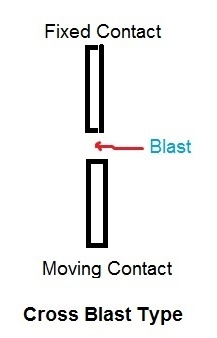 When the moving contact is withdrawn, an arc is struck between the fixed and moving contacts. The high pressure cross blast forces the arc into a chute consisting of arc splitters and baffles. The splitters serve to increase the length of the arc and baffles give improved cooling. Then the arc is extinguished and flow of current is interrupted. Since blast pressure is same for all currents, the inefficiency at low currents is eliminated. The final gap for interruption is great enough to give normal insulation clearance so that a series isolating switch is not necessary. The air blast is directed radially in this type of air blast circuit breaker. They are very suitable for conditions where frequent operation is required. Arcing products are removed by the blast whereas the oil deteriorates with successive operations, the expense of oil replacement is avoided. Size of the device is small. The arcing time is small which results in less arcing energy, thus resulting less burning of contacts. The energy supplied for arc extinction is obtained from high pressure air and is independent of the current to be interrupted. Facility of high speed reclosure. Air has relatively inferior arc extinguishing properties. Air blast circuit breakers are very sensitive to the variations in the rate of rise of restriking voltage ( RRRV). Air circuit breaker maintenance is required for compressor. Air leakage at pipe fittings. Air blast circuit breakers have wide applications in high voltage installations. Used in systems operating at 132kv to 400 kv with braking capacity up to 7500 MVA and above, although such breakers are designed to cover a voltage range of 6600 V to 132000 V. Majority of circuit breaker for voltages beyond 110 kv are of this type.